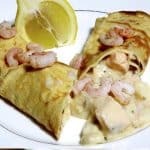 A traditional pancake filled with Cod, Smoked Haddock, Salmon & Prawns in a creamy white sauce. Add the eggs to the flour & salt and beat with whisk until thick and smooth. Gradually whisk in the milk. The batter mix should be of the consistency of single cream. Keep in refrigerator until needed. Take the defrosted fish fillets, remove the skin from the smoked haddock and cut into bite size pieces. Poach the fish in the vegetable/fish stock for 3 - 4 mins. Remove the fish and use the stock for the rest of the sauce. Melt the butter in a saucepan on a medium to high heat, add the plain flour to make a roux. (loose paste) Gradually add the milk & stock stirring constantly until you have a smooth sauce. Gently simmer for 5 - 10 mins. Add the fish pieces and the prawns to the sauce along with the chopped chives and parsley. Correct the seasoning. Stir in single cream. Add a tablespoon of oil to a frying pan and place on high heat. Pour out excess oil, return to medium heat and add a ladle full of pancake mix. Make sure the mix is spread evenly in the pan. 2 minutes each side. Place the pancake on a plate add a few spoonfuls of fish in sauce making sure you spoon in a variety of the fish and prawns. . Roll the pancake around the sauce. Add a few of the remaining prawns for garnish. Serving tip: to help make sure everyone is served at the same time. Make the pancakes in advance. Add the sauce, place all the pancakes on a baking tray and finish off under the grill or in the oven for a few minutes before serving.